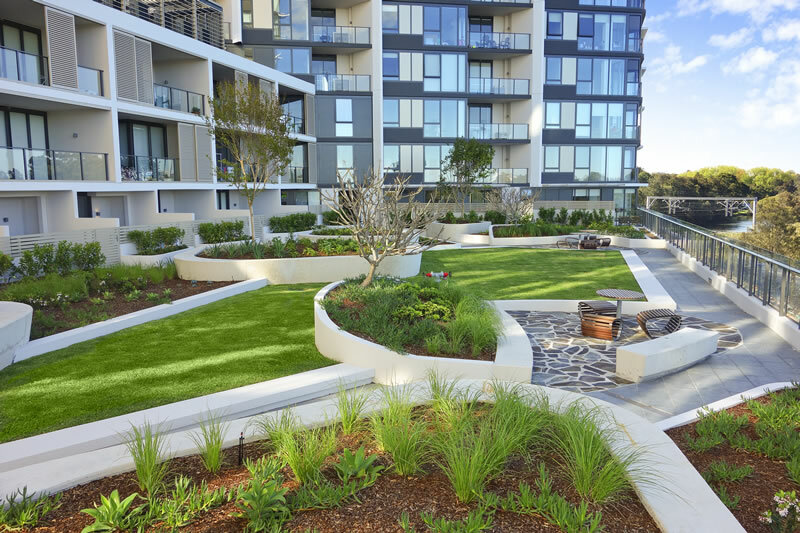 Fresh Landscapes worked on the Shore Discovery Point Project in Wolli Creek. Shore Discovery Point represents a further contribution to the development of Wolli Creek. The residential apartment block consists of 323 apartments on the beautiful Cooks River. Fresh completed a 3000m2 podium roof top garden that was situated between two residential twin towers. The landscape consisted of 600m2 of granite paving been installed with stainless grate finish drains, formed up with class A finish concrete planters, block work with rendered finish to elevated lawn area. The project also consisted of a detailed design for the irrigation system that was designed and install by Fresh landscapes sister company water pro. This area was designed to have two break out and entertainment areas that were classes as communal open space for the residents to use. Both areas consisted of blue stone flagging been installed as (crazy paving format), the furniture used was from a designer in Melbourne with a high-quality finish. Fresh installed over 10,680 of different plant varieties throughout this project. With the large podium level, all materials were craned into position including 4 large ex ground tree. Ground Floor – Fresh consisted of water from public domain area that had a AC path way with steel edge installed, retention areas where constructed with block work and heavy PA lining, filled with filtration layers. A salt marsh area was constructed in the water way which was built by Fresh as we worked with the ecologists Dragon Fly to ensure all boxes where tick from and environmental aspect.